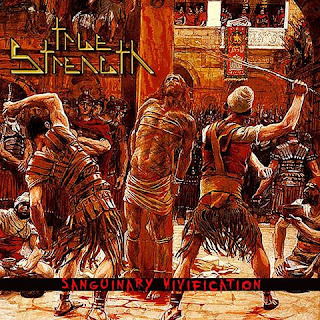 Δελτίο τύπου: «True Strength is back with their 3rd studio album, "Sanguinary Vivification", which will be released on April 19th, 2019 (Good Friday) in both CD and digital format through Roxx Records! Fans of bands like Sacred Warrior, HammerFall, Warlord, Iron Maiden, Bloodgood, Bride, Journey, Megadeth, Queensrÿche, Deep Purple, Kamelot, Sabaton, Thin Lizzy, and Rhapsody of Fire will absolutely love True Strength's new release! Lyric video: "Worthy Is The Lamb"
Bonus: All copies of the "Sanguinary Vivification" CD will come with a Limited Edition "True Strength Psalm 118:14 - Ryan "The Archangel" Darnell" Signature Custom Guitar Pick by Steve Clayton USA Guitar Picks!